The Conversion of rows into columns and columns into rows is called as Transpose of a Matrix in C.
In this article we will show you the step by step approach involved in transpose of a Matrix in C Programming language with example. 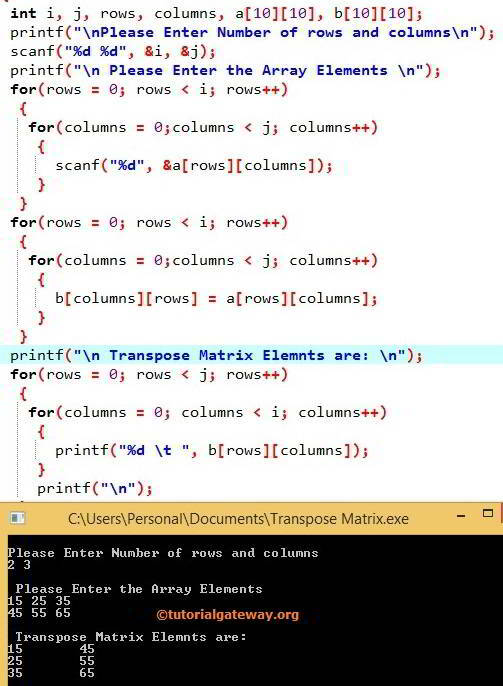 This transpose of a matrix in C program allows the user to enter the number of rows and columns of a Two Dimensional Array and then we are going to convert rows into columns and columns into rows (also called as Transpose of a Matrix in C). Next for loops, Will traverse as we explained above but instead of transposing it will display the values one by one using the printf statements inside them. If you observe the above for loop in this C transpose of a matrix program. We assigned the rows to j and columns to I because, initially user entered values 2 rows and 3 columns. After transposing the matrix it became 3 rows and 2 columns, that’s why we assigned j value to rows and i value to columns. If it is not dynamic program then you can place the constant values directly in the place of i and j.